By Just Harvest on June 26, 2015 in Barriers to Benefits, Blog, Get Involved, Take Action! An estimated one in four working-age Americans—65 million people—have a criminal record. Because of this, many of them will likely have a difficult time getting a job. This also makes it difficult for them to rejoin society as productive citizens, forcing them onto government assistance programs in order to survive. Any day now, members of the Pennsylvania House of Representatives will be voting on HB 222. If passed, this bipartisan-supported bill will ban people who have ever been convicted of a felony for selling drugs from receiving food stamps and other public benefits. In recent weeks, Just Harvest and fellow advocates have been meeting with key state legislators, and educating them about the unreasonable effects this bill will have, especially on women and people of color. We have made some progress. Amendments have been added to decrease the severity of the bill, including reducing the lifetime ban on public assistance to a 20-year ban. But what is the motive behind HB 222? A ban on government assistance does not exist for those convicted of other kinds of felonies – say, murder. Nor does it bar people with drug convictions from receiving other kinds of government benefits, like corporate tax breaks, small business loans, or a legislator’s salary. 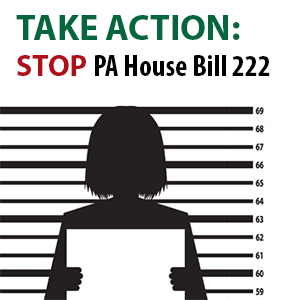 The purpose of HB 222 is only to cruelly further punish people who have already served lengthy sentences and are at a critical turning point of transitioning from prison or completion of a drug treatment program to mainstream society. That, and to perpetuate the myth that food stamp and other basic assistance recipients are all drug-addicted criminals. Most food stamp recipients are the elderly, people with disabilities, children, and low-income working families. Drug addiction is only found in a very small percentage of welfare (TANF) and food stamp recipients: 3.6% and 5.4% respectively. These drug dependence rates are comparable to those of people who don’t receive government benefits. But let’s take a look at the worst of this myth—at one of the supposed monsters who receive government assistance. Here is the story of Sara, a woman who was addicted and selling drugs while on welfare. She was a teenage, unwed mother at the time as well. Sara is everything that people who rail against safety net programs hold up as the reason “those people” don’t deserve sympathy or help. Read her story, and then ask yourself: Should state legislators be seeking to help people like Sara turn their lives around after the bad choices and lousy circumstances of their youth? Or should they be spending their time in office coming up with ways to kick them when they’re down? If you agree that Pennsylvania should be helping people avoid returning to criminal activity by giving them basic assistance while they seek reputable work, take action today to help make sure people like Sara get the second chance in life they need. Call your legislator and tell them: House Bill 222, even with amendments, is bad policy. I urge you to oppose HB 222.